I may have to start that conversation with ya soon! Right at the moment im limited to casting equipment that can sit on my kitchen countertop without my wife getting too mad at me. Just some rtv molds and casting resin... Injection molding may be a while down the road. But any tricks or cheats are certainly welcome to keep the bad casts to a minimum! They can take a 3D design, create the part with stereolithography and other methods, then make RTV molds for short-run production (i.e. VX owner quantities). I have Solidworks 3D software, and the rail covers, compared to tiny medical devices I have designed, are like tanks. The rapid prototype shops have so many cool materials now that there is bound to be one that will remain strong in thin cross section, won't fade in UV, plus the rail caps aren't load bearing since they have to be removed to put the roof rack on. There would be no need for injection molding, which is good since I doubt anyone here would be in to paying some of the $10-15k for the tool to be made. Total cost for a part like the rail cap and then runs of 100 or so might be <$2000 with a per part casting cost of $10-20 off the top of my head. Really the only trick is to get the design in to Solidworks or some other CAD program accurately. Im saving up some money for a makerbot replicator desktop 3d printer. Im familiar with sketchup, autocad, and meshmixer which is an advanced sketchup... with some practice and experience im hoping to get some good use and fun out of it. But first thing is getting $1800 for the printer... for now im getting pretty good at duplicating existing parts. so far the demand for them isnt anywhere the 100's or 1000's so my kitchen based replicating factory with my spare time is meeting demand so far... its a whole other catagory recreating parts in the computer and having a CNC or 3D printer do the work for you! Certainly a catagory that im interested in! The rapid prototype guys I work with (http://www.spectrumplasticsgroup.com...ithography-sla) will do castings from 1-10, 100, 1000, or anything in between using RTV molds of SLA parts and lots of choices of casting resin. They have other options for part counts above 1000. But we don't need that. I have a great relationship with these guys, so if you have any questions, just let me know. Any relationships close enough to land me an interview or at least a few hand shakes? Im a draftsman at an architecture firm in Denver, but working in 3D printing would be a DREAM JOB for me! I didn't even know you were in Denver! We can meet and talk over a beer or food anytime. Protegenic is up on 120th and Huron-ish. There are several other places, and I have some contacts in the industry that might help. Totally looking forward to it! Thanks for the help! just got my 4 knobs.... they look stellar !!!!!!!!!!!!!!!!!!!!! !1 thanks Vx Kat and Jasonm621 woooow 100% and very happy . highly reccomended! did you go with a color? If so, post piccies for us!! nah just went with black. im getting a sound system integrated to the spare tire space so i needed them asap. 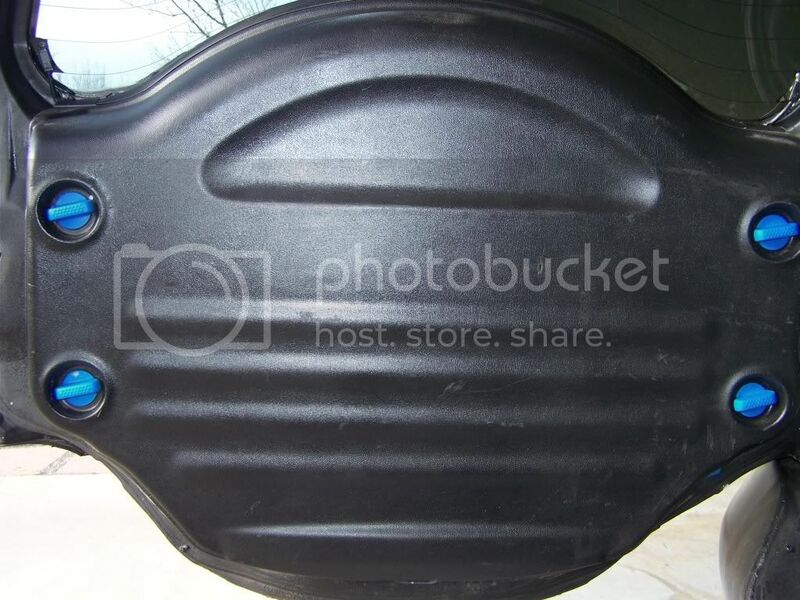 so just went with black but my car is black and the cover is too so i think itle look flush. as soon as the systems in ill post pics of it with the knobs. woop. yeah, that was the whole idea behind Jason making them solid, instead of hollow. Hollow was what caused them to break off at the neck after years of tightening them. Hey, anybody else get any flaps or knobs from Jason? If so, post up some piccies!! I posted a pic on my build thread a while back but forgot to add it here.